As I sit up here in this winter wonderland, ringing in the new year I can't help but be amazed at where this past year has taken me. Exactly a year ago I was exploring and surfing my way through Puerto Rico, snorkeling in Bioluminescent Bay, exploring the Spanish Virgin Islands, surfing the winter swells, and scuba diving. I flew back to Savannah just in time for my good friend Ed's wedding. After a quick stop in L.A. to visit Heidi and the Tole Mour I landed in Texas to the Odyssey. The Odyssey is a 35.5ft sailboat that I spent a month fixing up with the owner and then nearly capsized in halfway to Mexico in the middle of a big Northerner in the Gulf of Mexico. Limping back into southern Texas we fixed her back up, and with the help Heidi and Ryan we succeeded in sailing to Isla Mujeres, Mexico. There I jumped on another boat, this time a 44ft Lancer and sailed this one to Roatan, Honduras, San Andres, Columbia, and finally Bocas Del Toro, Panama. Both of these trips were incredible learning experiences for me as well as a good test for our relationship. I managed to get some wild cave diving in the Yucatan in, as well as some beautiful reef diving in Honduras. After so long out on the water I was craving some terrestrial time so I bussed it up thru Panama in Costa Rica and got lost in the wonder of Corcovado National Park on the Osa Peninsula, C.R. After some sweet waves at Pavones and Mata Palo I was on my way back to L.A. for a summer of fun onboard the Tole Mour. I was so excited for my 2nd Tole Mour summer program. The Tole Mour is the 156ft 3 masted tall ship on which I taught marine biology and sail training for the previous year and a half. The "brain trust" was reunited and some crazy adventures ensued including a great white shark attack on a sea lion right off the Santa Barbara Island sea lion rookery, and splitting my head open on my surf board at one of the most remote surf breaks in all of the Channel Islands that will remain anonymous for secrecy sake. The summer ended as usual with another incredible Voyage of the Friends with an unprecedented display from of whale friends. Another trip up to Vermont to see it during the summer and experience the famous "Stave Island Party" and then I quickly found myself packing down in Savannah for a huge Africa/Baseball4Africa adventure. Baseball4Africa season 5 went off without a hitch. We brought over enough donated equipment to replace any broken or lost equipment that the 11 current teams had as well as enough to outfit a brand new team. We also introduced softball to a new high school, a girls high school, and the local grade school. We figured the key is to start them learning the basics young. After teaching baseball for a month we were ready to see some wildlife, so after the big Baseball4Africa 2010 tournament we headed out on what would become a 9 country, 100 day safari through East and Southern Africa. *Zambia: aka the 'nemesis of the Turtle', getting thru a 18 hr 'bus ride from Hell' to pick up Heidi from the Lusaka airport, watching a cow fly after slamming into our car and ending the Turtle, and adrenaline seeking in Livingstone with lion walks, elephant back safaris, rafting the Class V rapids on the Zambezi, the trying to hit baseballs over Victoria Falls, and the infamous incident of falling thru a tree on the Zambezi Gorge Swing. *Zimbabwe: very pleased to see 500 million dollar bills are just tourists souvenirs, seeing the falls from the Zim side which is a must, dinner at the Victoria Falls Hotel, and surviving the worst night of Heidi's african sickness. *South Africa: Kruger Park and the Big 5, scuba, dolphins, and whale sharks at Sodwana Bay, Southern Right Whales breaching along the coast, surfing Supertubes at J-Bay, swimming with Great White Sharks off Gansbaii, Cape Point, penguins, Table Mtn, Kirstenbosch Gardens, and couch surfing in Cape Town, wine and brandy tasting in Stellenbosch, driving Route 62, Addo and Mntn Zebra National Parks, Golden Gate Nat'l Park, and a Johnny Clegg concert in Joburg. Phew. It was quite the 100 days. It doesnt seem possible that all of these adventures happened in just one year. Now after digging out from a christmas blizzard in NJ I am ringing in the new year in Vermont. And after looking at this year in review I can't help but look forward into what 2011 might bring. After a quick drive down to Savannah, Heidi and I will jump on a plane bound for Maui, Hawaii where we will start working as naturalist for the Pacific Whale Foundation. I feel so lucky that I am able to live this kind of lifestyle. The adventure continues. Well things have a way of working out. Waking up at 430am I figured I had time to do everything. I headed out under the cover of darkness, which was perfect for finding hyenas moving around the road just outside of camp. I paused and thought about stopping when a little baby hyenas popped out of the den. I was ecstatic. I had been wanting to see baby predators this whole 100 day trip...and here they were on the very last day. I took some pictures and another baby emerged...and then another. Three baby hyenas. Now hyenas aren't the most beautiful of Africa's creatures but when it comes to babies, puppies, they are pretty damn cute. It was still pretty dark outside so pictures were tough but I tried my best. 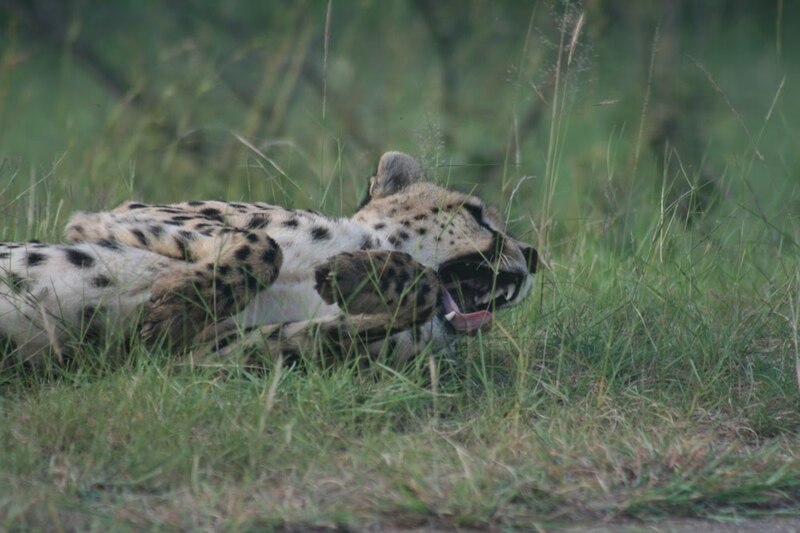 2 Cheetahs lying right next to the road. Basking in the sunrise with only one other car there. The other drive and I looked at each other and smiled, realizing how special a morning this was. I had not even hoped for a cheetah sighting this close. I was 20 feet from them as they yawned, rolled, and stared off at the sunrise. Magical is the only way to describe it. Cheetah are rare predators to encounter. 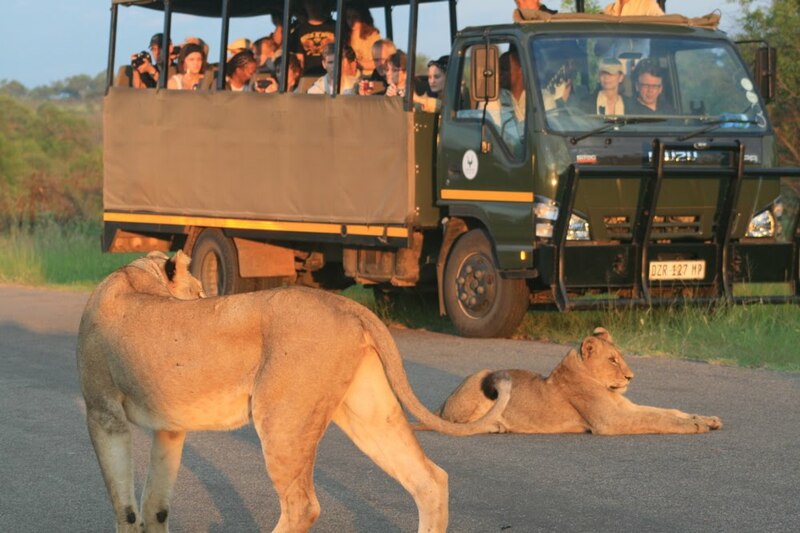 Kruger Park, being one of the premier places to see them, only boast about 180, compared to 2000 lions within its massive borders. This was the way to finish up my hundred day African safari. Now I can fly back to place where December means winter and snow, coats and hot fires...that is until I move someplace tropical. It might be sooner than you think. What can I say, the adventure continues. To all a very merry christmas. Well it’s my third time in Kruger National Park here in South Africa this month. I was here with Heidi for 3 days, my mom for 4 days and now I am back by myself for 4 days to wrap up my 100 day 2010 safari in Africa. I was hoping that the old saying, ‘third time is a charm’ would come into effect for me. Right off the bat it looked like it was going to be a lucky wildlife experience. 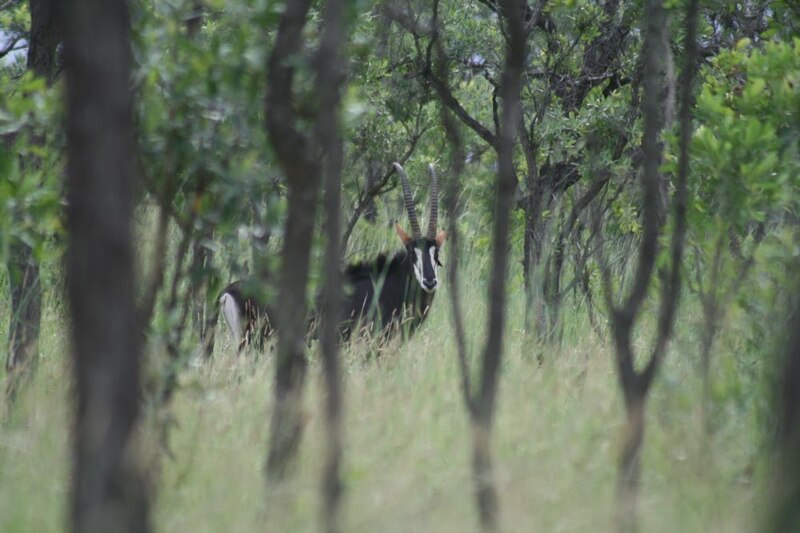 I caught a glimpse of a rare sable antelope thru the trees. He stood staring at me, not sure whether to run or to keep on acting naturally. We faced-off for a fleeting minute before another car drove up breaking the fragile peace and sent the sable rushing deeper into the forest. 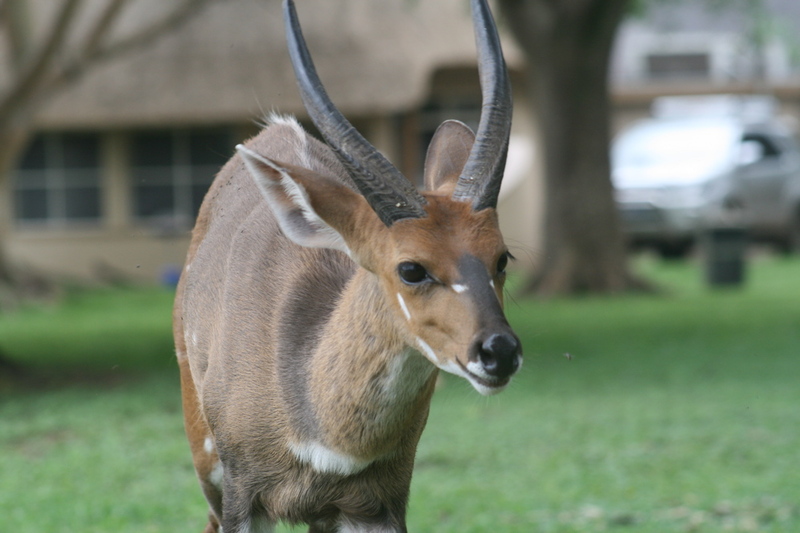 Not only are they very endangered, but their timidness and choice of dense habitat makes the sable a rare find. It was extra special for me having grown up with sable out on St Catherines Island, which the Bronx Zoo used as an off site breeding program for rare and endangered animals. 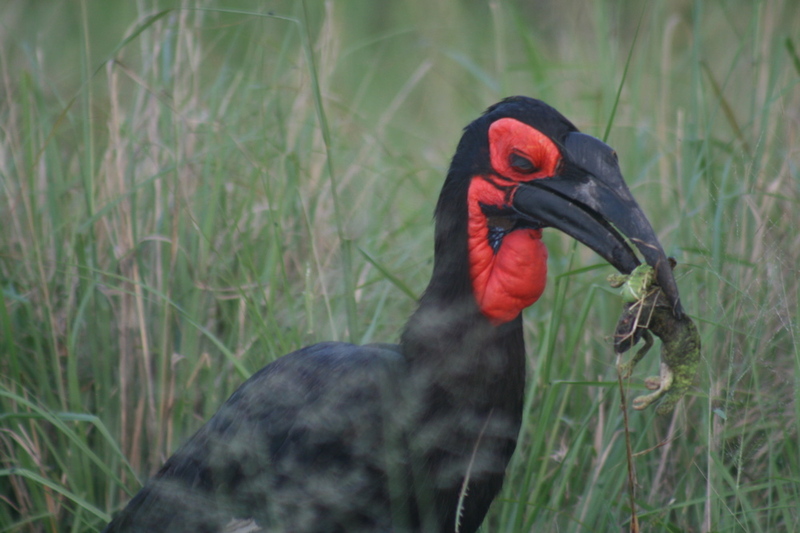 I have found that most of the animals on that island are some of the hardest to find here in Africa. Later that day and on into the next I found myself in constant site of one rhino or another. Sometimes I saw up to 6 at once. 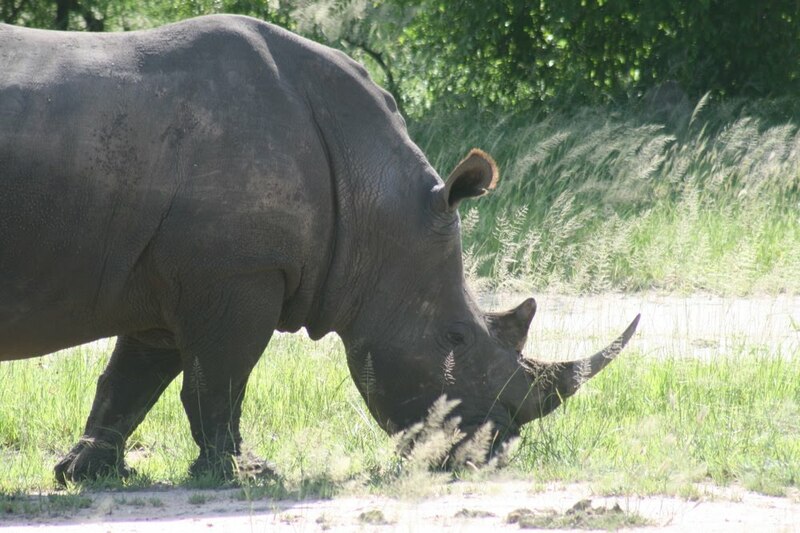 It was just rhino luck since sometimes they can be very elusive for such big animals. It was pretty magnificent seeing a mother and baby rhino walking in front of huge granite dome. It provides quite the backdrop for a picture. 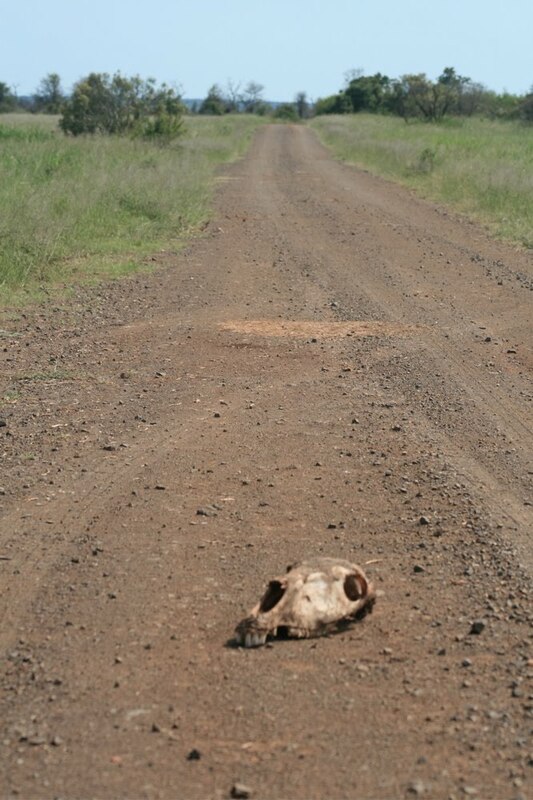 I did see a cheetah as well on the morning drive but it was very, very far off. Thanks for letting me borrow the binoculars dad! 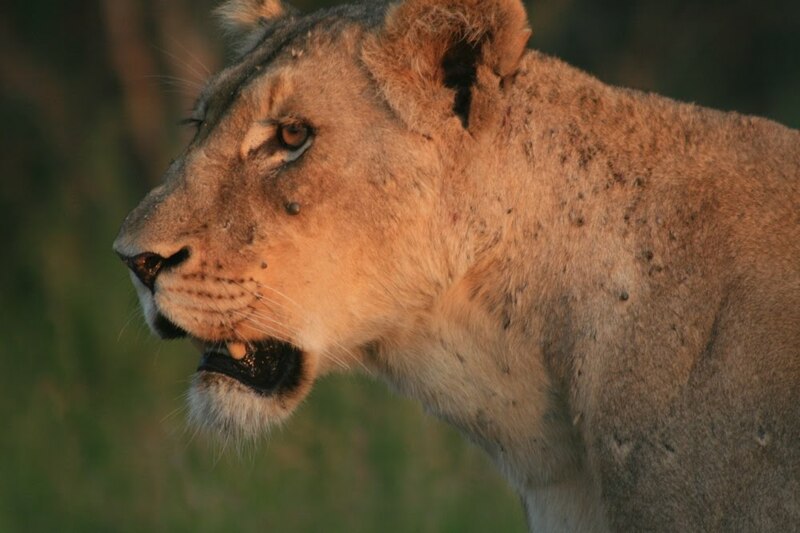 A close encounter with a male lion ended the day as I hit the sack early for my morning bush walk. I was up before my alarm after chatting with Heidi at 3am about Hawaii plans (its looking like a go). The guides for the bushwalk were late, then confused as they figured out they were supposed to pick up 4 people from the gate, then when we finally got to the starting point one guide found out his rifle was broken so had to drive all the way back to get a replacement. After all this we still managed to sneak up on a rhino. That makes 4 out of the big 5 that I have seen on foot in the bush. One of the other walkers spotted a yellow and black striped frog that looks a lot like a poisonous dart frog. A couple of wary giraffe rounded out the wildlife for the walk. Then it got hot, and hasn’t cooled off yet. The African summer is here. Its around 100 degrees here in the park and the animals are just motionless in the shade of trees. They can’t do anything. The nocturnal animals still have it good, or at least I assume since we only saw genets and scrub hares on our night drive. It seemed every pair of eyes that I spotted turned out to be a genet; 6 in all! This morning as usual I was out early, 5am and just in time to see 3 big male lions strutting away from the road. I drove on into a beautiful African sunrise and came across another big male lion lying on one of the side roads. 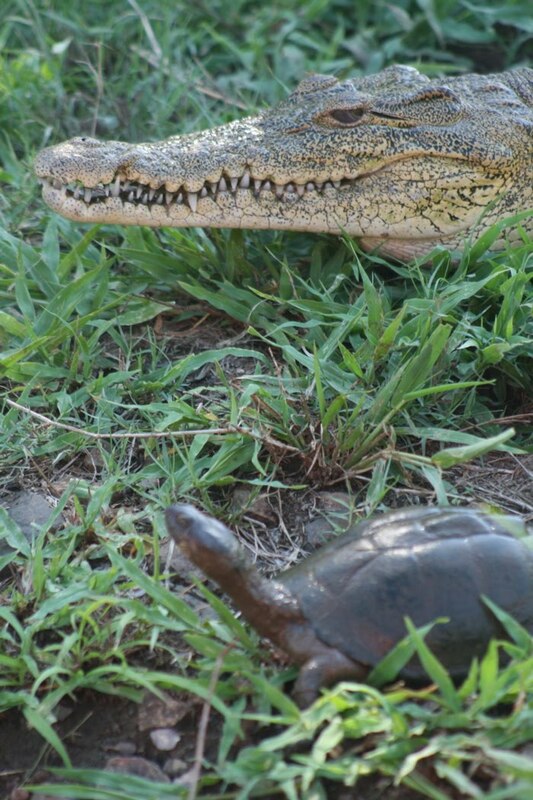 It was just him and me, which is a rare experience here in Kruger so close to one of the main camps. I was surprised when after a while he looked over to a big bush off the road and another big male lion strutted out onto the road. Now I was alone with 2 big lions right outside my door. I moved on, leaving them lying in each others arms, and enjoyed some back roads as the sun and the heat continued to rise. Day 1: After a long drive from Golden Gate Nat’l Park in the Drakensburg Mntns we arrive at the southwestern located gate of Melalane and entered Kruger National Park in time for an afternoon game drive. We spotted impala and two warthogs with 9 babies all pushing to get their share of milk. 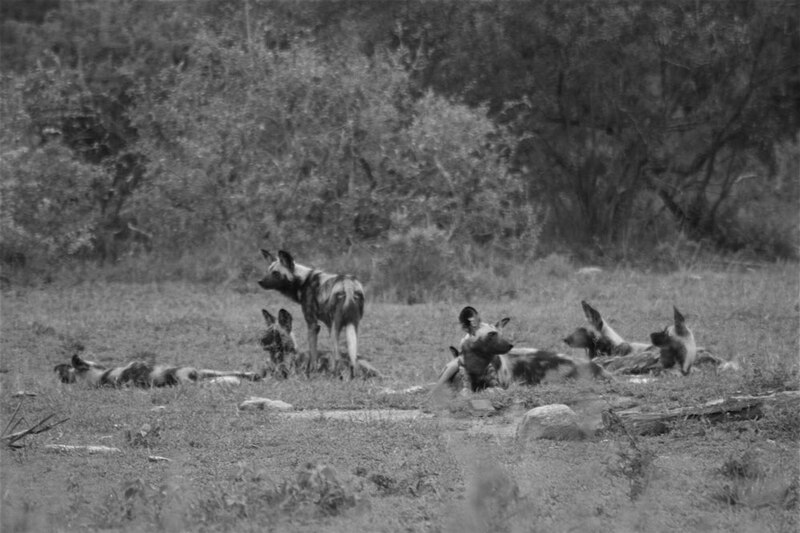 Then we came upon a pack of wild dogs, one of the rarest predators in Africa. They were lazing about in the afternoon sun, occasionally looking up and twitching their big Mickey Mouse ears. 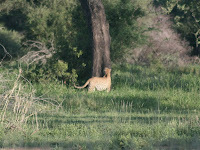 We moved on when we heard there was a leopard hanging out in a tree a few kilometers away. He was far off the road but still quite beautiful to see. Four big white rhinos were next. They were investigating each other and one even gave another a pretty powerful hit with his horns. 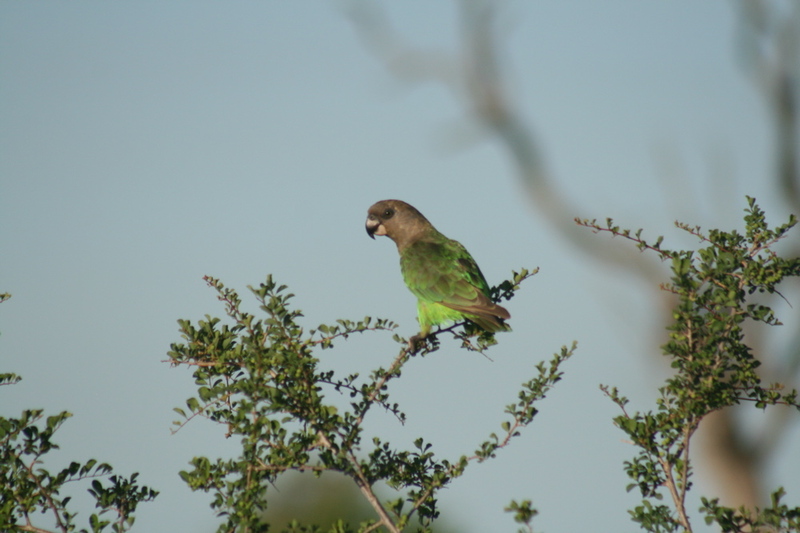 Then the birds started to come out; beautiful blue and purple colored rollers, big birds of prey like the marshal eagle, two African green pigeons, and a wattled plover, which I hadn’t seen before. 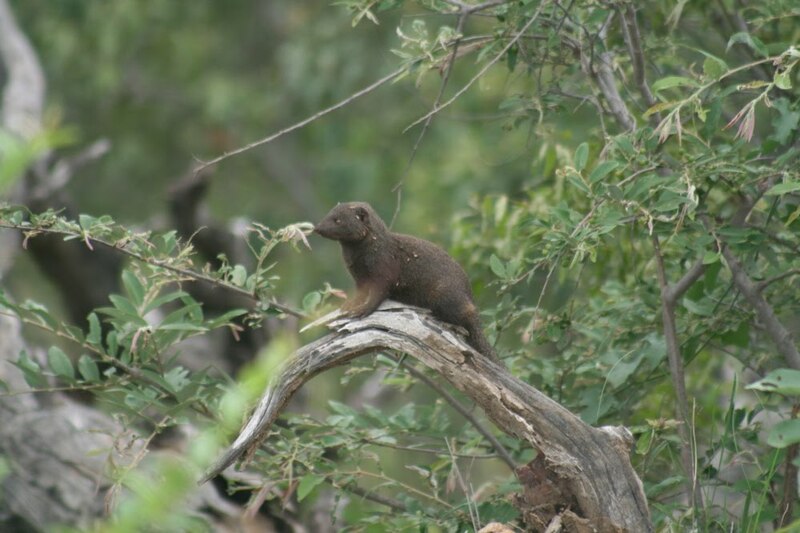 A tiny dwarf mongoose ran up an old log to check us out and one grumpy elephant stopped traffic as we tried to make it to our camp before the 630pm deadline. Day 2: We woke up naturally but still very early which is a great time for seeing animals. We quickly broke camp and headed north. 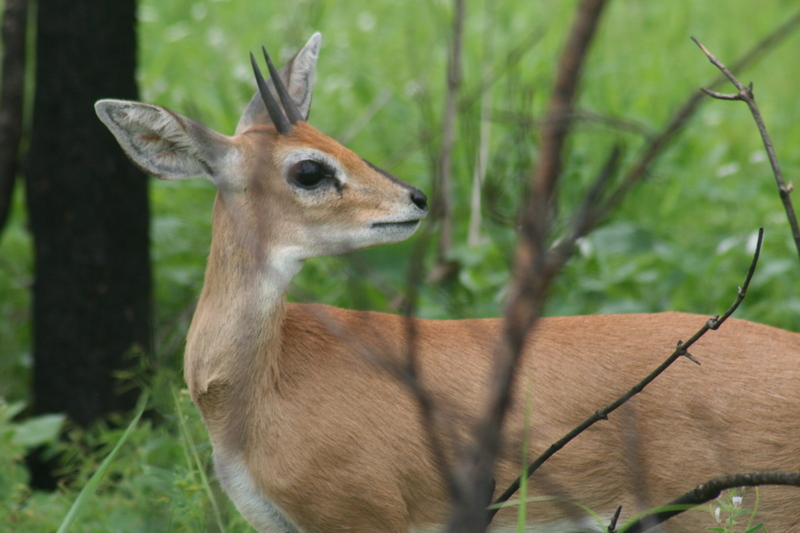 Impala were everywhere; there are over 100,000 in the park. Zebra, wildebeest, and elephants also roamed the bush nearby the roads. Our next big find came when we slowed down to see what some stopped cars were taking pictures of and it was a Serval and her baby. These are very, very rare cats to see. They look like lithe, little leopards about twice as big as house cats. I spotted them a few times in the dense thicket but they soon headed deeper in the bush. Everyone left except for us. I was still hoping they would come back and give us a better look. We waited some more and then I glanced in front of us and they had gone about 100 yards up through the bush and come out onto the side of the road! We slowly drove forward and had a perfect view of them playing naturally, the young one running and jumping over its mom and then climbing a tree. All the while the mother didn’t give the baby a second glance, just let him expend his youthful energy. We drove on past more impala, zebra, giraffe, and elephants and caught our first glimpse of waterbuck, kudu, and black wildebeest. After setting up camp and having some delicious pb&j sandwiches, mom and I went to the meeting point for our night safari drive. We loaded into this huge 20 person truck which was a little different than the one at Addo because instead of the guide holding the spotlight there were three seats in the back with lights for us to use to spot animals. I jumped at the opportunity to be a spotter. It was great fun. We found a small and a large spotted genet, a small cat-like nocturnal predator, another serval (that makes 3 in one day), a barn owl, lots of hares, a vine snake, and some possible hyenas. Day 3: Another early wake up for me as I had signed up for the morning walk. It was about as extreme as a walk can get. We left at 430am, drove 20minutes out into the bush, got stuck on the way, finally parked under a tree, got out, and started following our two armed guides deeper into the bush. We saw fresh lion tracks almost immediately and started following them. (my kind of guides). Then we heard a leopard so we went towards it. Then I spotted the leopard walking a hundred yards in front of us. He strode across the edge of the field, in and out of bushes, until coming to a big tree. He checked it out, thought about climbing it, and then strode off in the other direction. 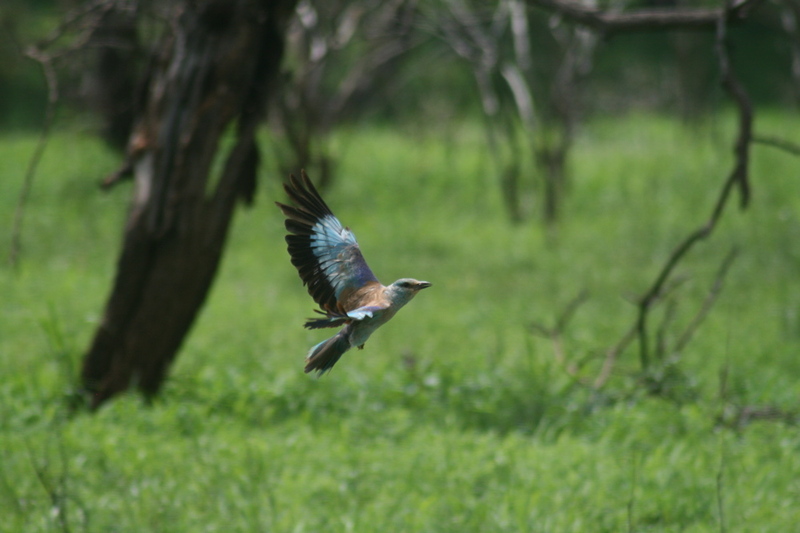 Then he noticed us and took off into the deep bush. He was close enough for me to see his bulging muscles as he walked. I couldn’t believe we saw a leopard on a walk! Then the guides spotted some vultures in some far off trees. Thinking there might be a lion kill we headed towards the vultures. Turns out they must have been there for a leopard kill as we saw lots of zebra and wildebeest hanging out nearby acting very nonchalant meaning there probably wasn’t any lion in the area. And the day was just starting. 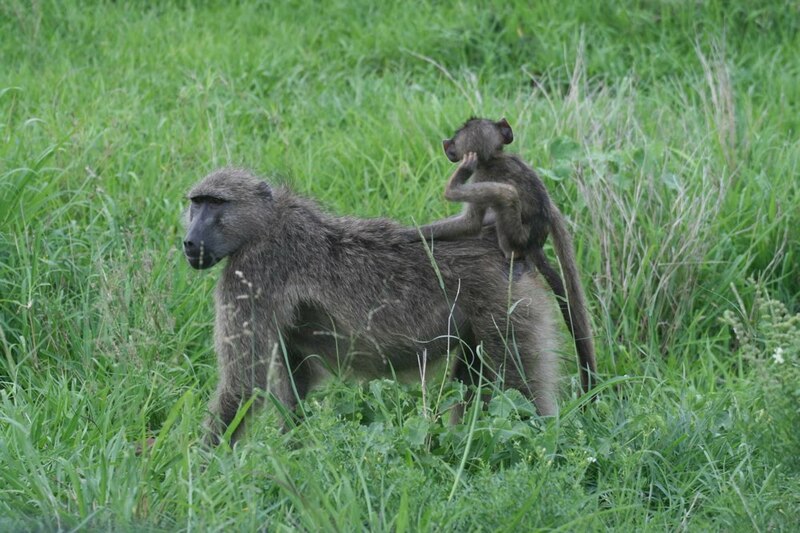 I picked up mom and we headed out for another self-drive safari. We saw two female lion across a large lake, and then came across another group of wild dogs! They were very close to the road in the shade of some trees. They were play fighting like dogs will without a care for all the cars lined up to see them. After twenty minutes they got up, one by one, and bounded off. The next big sighting came when we stopped to watch a herd of elephant coming up from a dip in the river. They were accompanied by the smallest elephant I have seen to date. He must have been born only a few days or weeks earlier. 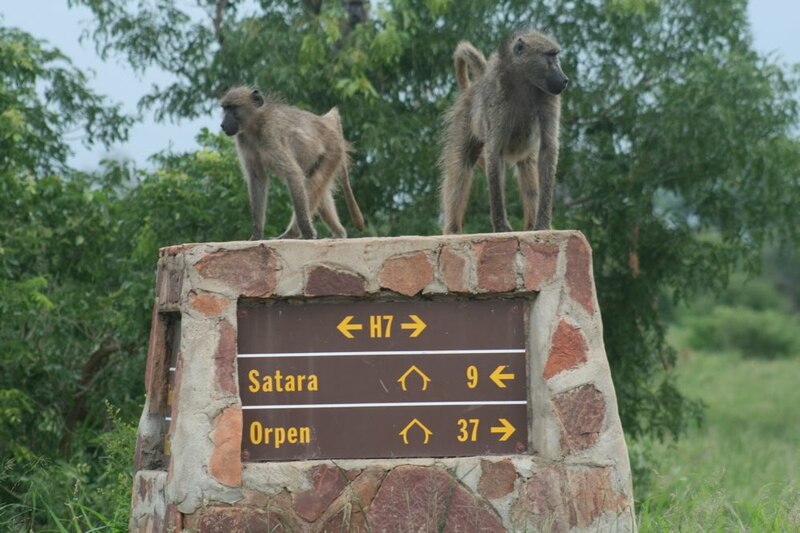 I was pumped to make it to our next destination, Letaba camp, because we were signed up for another night game drive. I jumped on the spot light again. We followed the river and caught some glimpses of hippos foraging out of their waterholes. 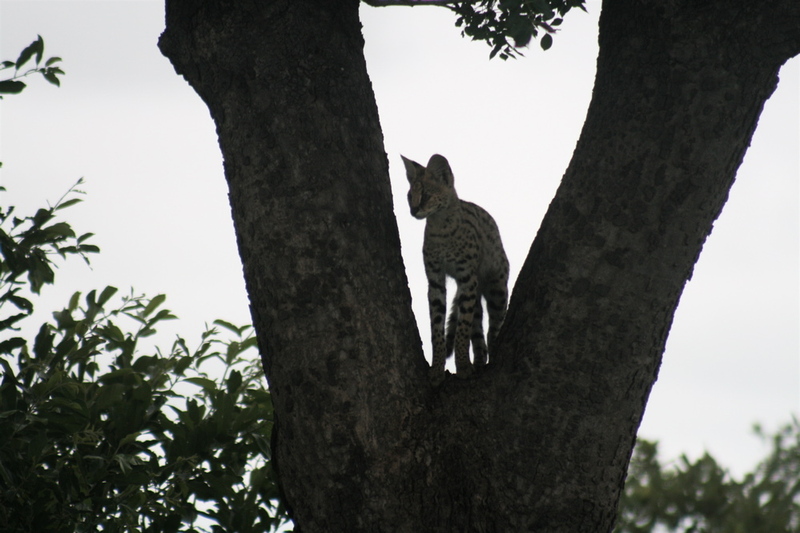 We were checking out a possible genet when our guide shouted, “leopard crossing the road!”. We all looked forward and saw not one, but two adult leopards crossing the road. We followed them with the spotlights as they turned and walked to our left. Pumped up from seeing leopards twice in one day I was totally satisfied. Then came the real treat. 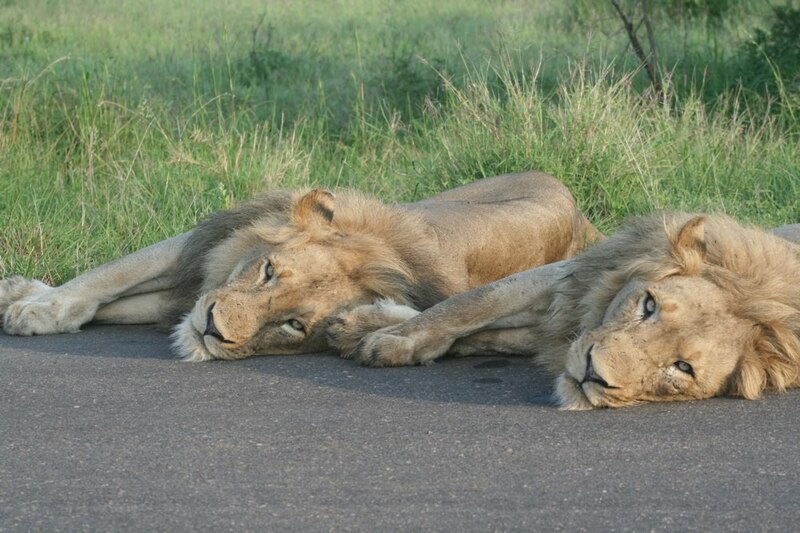 A big male lion lying down in the road, soaking up the heat. We watched it awhile before it got up and walked right past our truck and off into the bush. Then another big male came padding down the road towards us. As it walked past us it started to roar, which was answered by the first lion in the bushes behind us…and another unseen male lion in front of us! 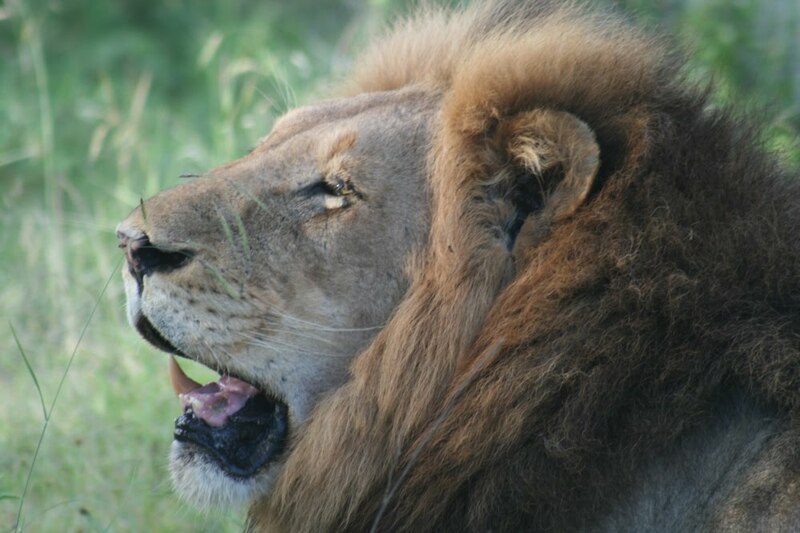 It was this deep, permeating, surround sound that leaves no question as to why lions are considered the king of all animals. Day 4: After our incredible night drive we decide to have an easy morning. Mom and I break camp and do a quick run to the bird hide overlooking Engelwood Dam before heading back into camp for a nice, sit down breakfast. Then we head back south towards Satara Camp. On the way we pass the biggest herd of buffalo I have ever seen. It reminds me of the vast herds of Serengeti. 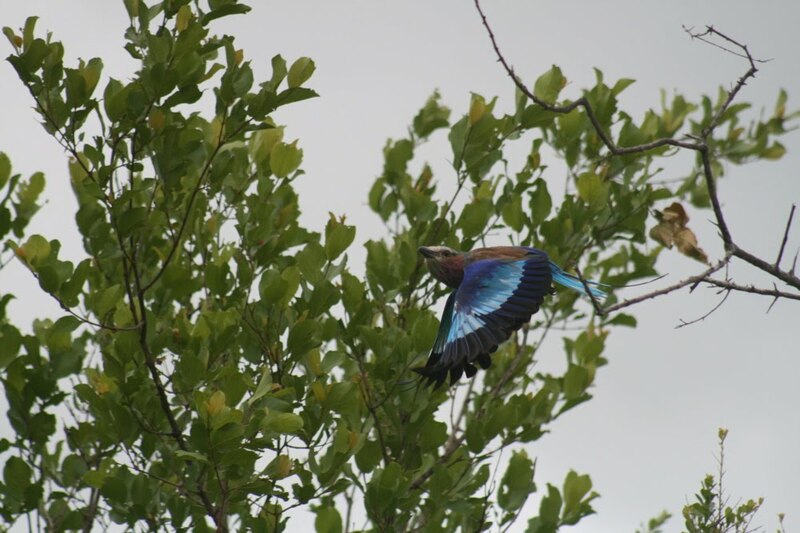 We see some of the big birds, eagles, ground hornbills, and a kori bustard. Then at the camp we find a resident Scops Owl sleeping with one eye open in a tree and a sleeping bush baby in the next tree. I’ve always wanted to see a bushbaby during the day. They look like lemurs with huge eyes and are active only at night. We watched a movie that night at the campsite on their huge outdoor screen and as we were watching we noticed a bushbaby walking along the telephone lines. I followed him for about ten minutes before he found the tree he was looking for and shuffled onto it, sticking his head deep in a hole in the tree. Day 5: We had another early wakeup this morning in order for us to drive about 600kilometers to Johannesburg in order to make it for a Johnny Clegg concert. 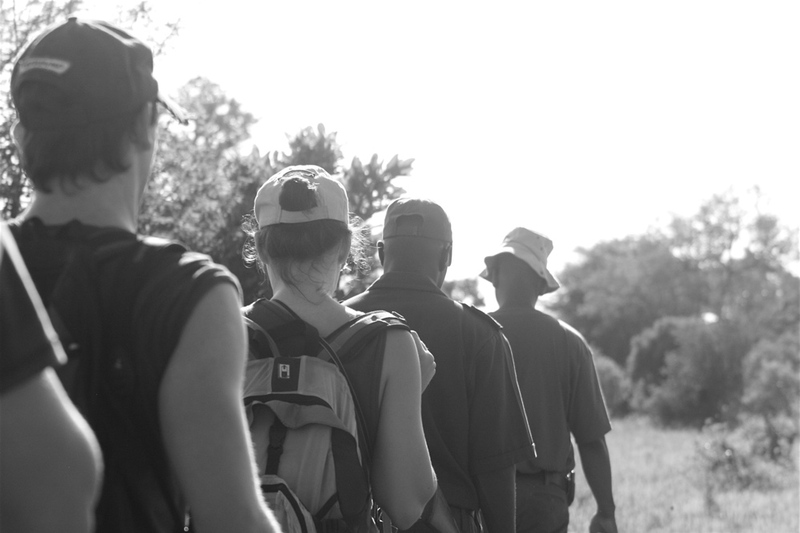 We enjoyed the beautiful, lush, green grass of Kruger in the summer as we headed out. Wildflowers are everywhere and the smells of nearby animals are drowned out by the beautiful smell of flowering plants. We stopped to check out a couple of female lions apparently also enjoying the green lushness before heading out of the park and back into civilization.